Ok, so you just finished your data studio masterpiece and its time to share! How you share depends on who you want to share it with and how much access you want to give them. One of the reasons Data Studio was developed was to increase the ways Google Analytics visualizations could be shared. While analytics had some decent dashboarding options within the application, it was difficult to share these beyond registered users. Data Studio goes way beyond mere Google Analytics reporting, but sharing options are still a major reason for the adoption of the tool. Check out the questions below to find the case you need. These answers start with giving the viewer the least amount of access and work to sharing with trusted collaborators. How do I share a Data Studio Report through a public web page? Answer: Use the Embed feature of Data Studio: FIle/Report/Embed menu option pops a dialog box with embedding options and code. Copy the embedding code into a web page and anyone who views the web page can then view the report that is embedded in the page. 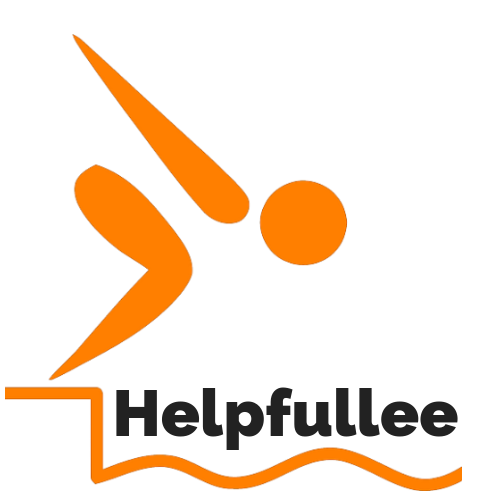 Here’s an example of an embedded data studio – this shows the top 5 web pages on the Helpfullee.com website, pulled from analytics – You can filter it by source. Note that any embedded resource can be embedded on any number of pages. This means that other people can use your embedded resource on their own sites. Depending on your intent, you may want to use a background watermark of some kind. You can also include Google Analytics setup in your report so you can track the pages that users are viewing from. Here are the steps to embed a Data Studio Report. Select “Embed Code” or “Embed URL” . Optional – change the height and width parameters. Here’s a video showing the whole process of embedding the widget into this page as you can see above. Responsive `Google Data Studio` Inline Frame Embed Code – Short post on making your embeds resize nicely. How can I share my Data Studio on Social Media? Answer: You can share your report on social media platforms the same way you would any other web page. As of July 12, 2018, Data Studio supports the Open Graph Protocol tags that allow a better sharing experience including an automatic thumbnail and description of the report. It can now also be shared as an embed on sites like Medium. ProTip – By default, the report will have the standard Data Studio description -“Google Data Studio (beta) turns your data ….” as seen in the Twitter preview below. This is what will show up if you share your link on Twitter, Facebook etc. But you can change this and you should! Locate the Data Studio report on Google Drive. Through Drive, you have access to all editable Data Studio reports but as of this date, they DO NOT show up in search! You can find them by scrolling down your root “My Drive” contents. Click on the file and a file description panel will open on the right side of the screen. Scroll down a bit and you will see the default description. Click the edit button to set your description in the field and click anywhere outside of the box to save. Here’s a How-To video to walk you through the process of changing the description. How do I share a Data Studio Report with the public so they can’t edit or copy it? Select File/Share menu and it will pop the sharing dialog box. If you do not see the full sharing options click the “Advanced” link at the bottom of the box. In the “Who has access” section click the “Change” link. Select “On – Public on Web” or “On – Anyone with the link”. Click the Save button then Done button to complete setup. Note: This also disables the ability to do CSV, Sheets or Excel export of graph data. You can share the report by getting a share link – click on the share icon and copy the URL. How can I share a Data Studio Report so public viewers can use it as a template for their own data sources and NOT able to edit my original report? Answer: This is the default setting for Data Studio Reports. When you share a report the viewer will be able to copy the report and replace your data sources with their own. Select the share icon. The sharing dialog box appears. Click on “Get Shareable Link” top right. Use this link to share with users. They will be able to copy the report and use it as a template. Double check the sharing settings by clicking “Advanced” bottom right. Make sure the checkbox labeled “Disable options to download, print, and copy for commenters and viewers” is unchecked. Click “Save” if necessary, then “Done”. When people copy your report your original is secure. Copiers will be prompted to use their own data sources. If they do not have similar data sources the visualizations will break. If you have created new dimensions or metrics in your data source, these are not copied with the report. If you have used these in your visualizations the copied report will break unless the new user creates those same dimensions and metrics in their data sources. A good practice is to include instructions for setting up the customer dimensions. If your report uses filters that are unique to your data source, like custom segments from Google Analytics, it may break the visualizations in the copy if the user does not have these also. ALWAYS TEST – Get someone else to copy your report and make sure it behaves as you expect. If you have to do this yourself, make sure you use a separate Google account from the one you created with. Heads UP! This option to copy a report only shows to the viewer if they are currently logged in to a Google account. If they are not logged in they will not see the copy option! This is the case in Chrome’s Incognito mode, and it is easy to get fooled into thinking the report is not available for copying if you are using this mode for testing. When you first open an Incognito window you are an anonymous user. If you go to Google and log in with an account you will see the copy and share options, which are the default. If you don’t want users to be able to copy your report, it is important to change those settings and test it with a logged in user just to be sure. Again, you can share the report by clicking on the Share icon and copying the URL. How can I share a Data Studio report with viewers so they can use their own data sources immediately without having to copy the report? Note that the viewer is limited to selecting data sources they actually have access to while looking at the report. A user that is not logged in will not even be able to see the data selector. Dynamic selectors will also not appear in embedded reports. 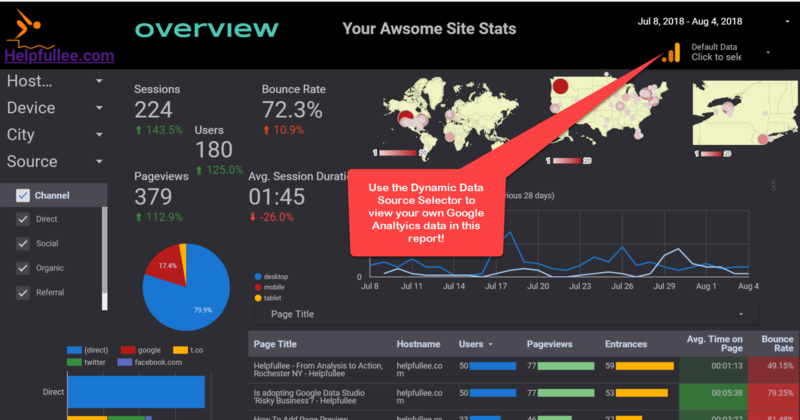 Below is an image and link to a report that uses a dynamic data source selector so you can connect your Google Analytics accounts to the report without copying it. You can use this report right away with your own analytics accounts – Enjoy! How can I share my Data Studio Report so viewers can only see graphs based on data sources they are allowed to access? Answer: Change the “view with owner credentials” setting in the data source setup. This will allow you to share the report, but only people with access to the underlying data sources will be able to see the visualizations. If you are using Google Sheets as a data source, using this setting will be based on the Google Drive sharing settings for that Sheet. If your viewer has view access to the Sheet on Drive from their account they will be able to see the visualizations. Example: You have a have a web report based on Google Analytics, but only want users who actually have access to that Analytics account to be able to view the report. Edit the report. Select a Data Source and click the edit icon. Select the text “Using Owners Credentials”. This will pop a dialog box. Select “Viewers Credentials” then “Save” and “Done” to exit out of the Data Source editing mode. Here is a snapshot of what it will look like for authorized and unauthorized users. Note: If you set to “Viewers Credentials” a user will be forced to log into Google to view the report whether they are authorized or not! How can I share a Data Studio report with specific people so they can edit, but not have access to the data source? Answer: This is pretty much the default setting when you share editing rights with an individual user. They will have the ability to use any existing fields available in the data source to modify the report, but they cannot modify the data source by adding new calculated dimensions or metrics, and they cannot modify any existing ones. If you want an editor to be able to add new fields, you will have to also share the data source – see the next section for more. Select the sharing icon next to the edit/view button. Input the email of a new editor. Note: Only emails with Google accounts will work here. Write a note if you wish. This will be sent to the editor in an edit notification email. Click Done. The new editor will get a notification that you are sharing edit rights with a link to the report. How can I share a Data Studio report with an editor so they can add or modify custom fields? When you share editing rights with other users they cannot add new fields or modify existing fields that you have created. They cannot even view the field settings or formulas used in these fields. In order for editors to add or modify fields, you must also share the data sources used in the report. First, make sure you are sharing editing rights to the report. Then modify the sharing settings for the data sources following the steps below…. Starting at the main data studio page, select “Data Sources” (upper left side) . You will see a list of all your data sources. Select the three dot menu on the right side of the data source listing. Select “Share” option. A sharing dialog box will appear similar to the ones used for setting report sharing options. Click “Advanced” on the bottom right. You will now see more sharing options. We suggest you click the “Prevent editors from changing access and adding new people” unless you really want other people to be able to add more editors to the connector! Click “Save”. Input the name of the editor you wish to be able to add or change fields in your data source. Add a message to send to your collaborator. They will be notified via gmail. Click Done. How Can I Transfer Ownership of a Data Studio Report based on Google Sheets? Answer: The new owner must have a Google account. The new owner must copy the report, have full share access to the connector, and ownership rights to the Google Sheet. So , this question came up recently: A freelancer developed a Data Studio report for a client. She would like to transfer all ownership to the client so she can wrap up the job. How is this done? First, keep in mind that the Google Sheet you are using is kind of like a database: If you are the developer and are accessing it with your credentials the client needs similar access. If you want to turn this over to the new owner, they need full control of the sheet, rather like giving them a copy of a database. In the video below I walk through the steps to transfer control from one of my Google accounts to another. How To video on transferring ownership to a client. Thank you for this post Lee. Very helpful information. I am interested in knowing whether Data Studio can be used to authenticate non-google users and based on the user credentials, can allow them to view specific graphs? For e.g. user@company1.com and user@company2.com login -> company 1 and company 2 use the same data source. But data is being tagged with their respective company names. Can there be parameters passed during user login based on the company name as to instruct data studio to show the relevant company data for the relevant user? HI Barani – Sorry for the delay posting a response here. I wanted to think about your question some before answering. So far, I haven’t seen any way to restrict data outside of Google’s identity systems. The Google system is pretty extensive, but outside of that I can only see making separate versions for individual users which is ok, but does not scale well. You could embed a report inside a page and protect that page , but that only gets you security , not personalization.